H4P has participated in three local events. The first was at the archaeological park of Carranque in Toledo, where a conference was held on the importance of protecting cultural heritage. Our Chair, Isber Sabrine, spoke on Syrian Heritage during the conflict. The second presentation was a video presentation to the Palmyra Forever (in Italian) conference in Bologna on the 13 May. The journalist Maurizio Abbati interviewed Isber about the destruction of Syria’s cultural heritage, and about the work of Heritage for Peace and its projects. The third presentation on the work of Heritage for Peace was on the 19 May in the city of Tremp in the Pyrenees Mountains. The event was organised by the Ecomuseu de les Valls d’Aneu, to celebrate the International Day of Museums. 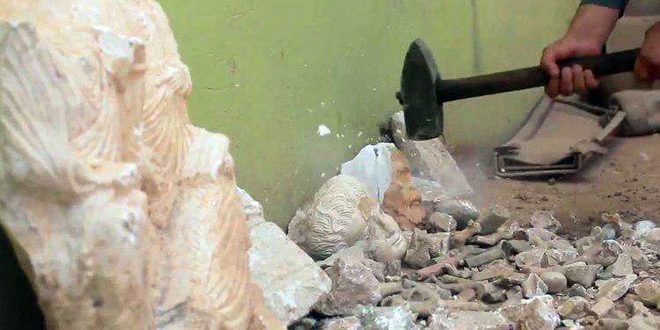 The Syrian Arab News Agency (SANA) reported the destruction of “several statues and antiquities that date back to thousands of years in Dura-Europos site in Deir Ez-Zor countryside.” Read more on the Syria Times website here, and in the Armen Press. A video reportedly shows damage in Daraa. You can view the video footage on Facebook here. The Awareness Office of the Tourism and Antiquities Protection Authority in the canton of Al-Jazira has documented archaeological sites in the Tell Hamis area (Tell Al Barda – Tell Al Lahm – Tell Banadori – Tell Drisyat ), available here. It also includes the Amouda area (Tell Ain Qirda – Tell Jatal – Tell Doger – Tell Marrit – Tell Khaled – Tell Sanjaq Sadun), available here. Additionally work was done in the Hull area, including : Tell Shalala, Tell Albuyer, Tell Jalala, Tell Almzraa, Tell Alhull, Tell Alshekh Muaz, Ayn Al Khan, and Tell Am Hjera, available here. The DGAM have updated their interactive map of conflict damaged sites and monuments. According to the Russian Ministry of Defense, missiles have damaged sites near Palmyra and Raqqa. Read more on CNN here and the BBC here. Read more on the Syria Direct website here. As part of the Emergency Safeguarding of the Syrian Cultural Heritage project, the UNESCO Beirut Office published a video explaining how to identify illegally trafficked antiquities and other cultural objects. Watch the video on Facebook here. The new Council of Europe Convention on Offences relating to Cultural Property, also known as the Nicosia Convention, includes objects that are part of the international “illegal trade of antiquities and cultural property.” The convention establishes a number of criminal offences, including theft; unlawful excavation, importation and exportation; illegal acquisition and placing on the market and other such activities and is now open for signature. Encouraged by Cyprus, who have a taken a leading role, 6 states have so far signed. The art dealing Aboutaam family are entangled in ISIS antiquities-looting investigations, in the Wall Street Journal here. Interview with Corrado Catesi, from INTERPOL HQ, about illicit trafficking of cultural property and how organizations like INTERPOL and UNESCO are working to stop it. India Times reports on Aleppo’s first visit from tourists since 2012. Local travel agencies organised a tour for more than 300 school children, students and pensioners who came to the ancient city from different parts of the country to immerse themselves in the city’s culture. The Awareness Office of the Tourism and Antiquities Protection Authority in the canton of Al-Jazira concluded its awareness program at the Kurdish Language Institutes in Al-Hasakah. The program lasted 4 days and was joined by more than 500 students. To learn more see here, and to see more photos of the event click here. The Director of the DGAM, Maamoun AbdulKarim speaks on the importance of museums in society, along with a number of other important figures from across the world, in this 2.35 minute video. Mr. Adnan Al-Bari, Director of the Department of Antiquities Protection in Al-Hasakah gave a lecture on the importance of archaeological sites and their history in Al-Jazira province at the Academy of Democratic Society in Darbasiyah followed by a field visit to the site. Photos of the site visit are available here. In a meeting with artists, Prime Minister Imad Khamis underlined the importance of artworks as representative of states’ civilisations and a way to express the people’s’ aspirations and deep-rooted history, according to the Syria Times. Around 60 art works made by 30 Syrian and Palestinian artists have been featured in The Road to al-Quds’ exhibition opened Monday in Damascus. The works depict adherence to land, homeland and heritage. At the Abu Rummaneh Cultural Center, a new exhibit focuses on “Syrian civilisation with its prominent figures, archaeological ruins and natural views. Read more on the SANA website here. Culture Minister Mohammad al-Ahmad discussed Syria’s participation in the Beijing Belt and Road Forum, highlighting the importance of Aleppo and Palmyra in the ancient route of the Silk Road. Read more on the SANA website here. Syria and Czech Republic have signed a Declaration of Intent to establish long-term cooperation in fields of restoration of monuments, protection of cultural heritage in Syria and holding exhibitions about Syrian monuments and culture in the Czech Republic. Read more on the DGAM’s website, the Syria Times, and on the SANA site. The National Museum in Prague will also assist with the restoration of Syrian artifacts. Read more on the Prague Monitor website here. The Culture Ministers of Syria and China met to discuss “boosting cooperation in the field of restoring the damaged antiquities…particularly the antiquities of Palmyra and Aleppo archeological cities.” Read more on the SANA website here. The American Schools of Oriental Research (ASOR) announced a new $900,000 cooperative agreement between the U.S. Department of State and ASOR Cultural Heritage Initiatives: “Safeguarding the Heritage of the Near East Initiative Collaborative Service Award.” Read more on the ASOR website here. Learn more and donate on the official ASOR website here. The Council on Library and Information Resources (CLIR) and the Antiquities Coalition are working on a prototype Digital Library of the Middle East (DLME) for cultural artifacts from the Middle East and North Africa. The Arab British Centre Award for Culture will celebrate individuals and organisations whose contribution to the dissemination of Arab arts and culture has advanced dialogue and understanding of the Arab world in the United Kingdom. Nominations for the award will be open from 25 May until 25 June 2017. The Antiquities Coalition and Johns Hopkins University, Paul H. Nitze School of Advanced International Studies (SAIS) have published “Culture in Crisis: Preserving Cultural Heritage in Conflict Zones.” Read the full publication on the Antiquities Coalition website here. Read the full abstract for “Layers of religious and political iconoclasm under the Islamic State: symbolic sectarianism and pre-monotheistic iconoclasm” here. Jordan hosted the World Economic Forum on the Middle East and North Africa, which included special attention on the destruction of cultural heritage in Syria. Attention was paid to concrete steps that can be taken to better protect cultural heritage during times of conflict. The opening plenary and videos of some of the sessions are available here. German researchers hope to one day help bring the devastated Syrian city back to life by creating a super-detailed map of the old city and its treasures. Read more on The Local website here. The charitable arm of Google and the UN have teamed up on a new website aimed at helping people better understand the Syrian refugee crisis through the combination of data from the United Nations High Commissioner for Refugees (UNHCR) along with satellite imagery, 360 degree photos and stills, videos, stories from refugees, and more. Tech Crunch has the full story. The Endangered Archaeology in the Middle East and North Africa (EAMENA) project has published an open appeal for historic aerial photographs of the Middle East and North Africa. HOYTS Cinema in Australia’s Sydney city has hosted the first ‘Syrian Film Festival’. The State Department is a month into a special project, working with the Smithsonian, to protect and preserve precious objects from the ancient world. Mark Taplin, acting assistant secretary for educational and cultural affairs, and Andrew Cohen, senior cultural property analyst, discuss the project. The Victoria and Albert Museum talks about its Culture in Crisis programme, including a blog and talk series. The New York Times writes about the current state and future potential for Aleppo, and reflects on civilian experiences in the city. Malek Jandali, a Syria-American pianist and the founder of Pianos for Peace, will participate in Australia’s National Refugee Week, 16 – 25 June. Read more on the Assyrian International News Agency website. The National Geographic published a short article about Damascus as an UNESCO World Heritage site. An opinion piece discusses the damages of looting in Iraq and Syria. Read the original piece on the Middle East Eye website here. ASOR CHI Principal Investigator and Academic Director Dr. Michael Danti speaks to the Wall Street Journal on ISIL looting and antiquities trafficking here.